Myfitness members get a 20% discount by using the ‘myfitness20’ code when making a purchase. The discount is only applicable to products with non-discounted prices. Be More Superfoods provides health-aware people who have busy lifestyles but who like to take good care of themselves with a solution for obtaining their daily nutrients, vitamins, and minerals from food as conveniently and efficiently as possible. 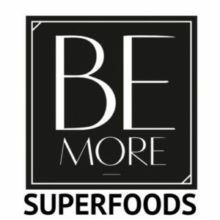 The Be More product range includes super food powders of exceptionally high nutritional value and vitamin and mineral content, which can be used to enrich your meals. With My Fitness membership card 10% off all flowers and flower accessories. Orhidaalia OÜ has over 30 years of experience in floristry. We have been acted in the manufacture and sale of flower arrangements and bouquets for many years. Building on our experience, we offer the best you deserve and we are always ready to accept new challenges. Our team includes florists, whise achievements have been recognized by international awards at variousflorists championships. Our creations include flower dresses, decorations on lakes, churches, manors, cars – wherever you want to add flowers, we always try to find a solution. We are ready to share this with you! For MyFitness members all products in OiOi web store are -20% off. For discount, provide promotional code „myfitness“ while placing the order. OiOi web store is created for Women who love gorgeous jewelry and know that it can only make them more beautiful! With OiOi jewelry we bring elegance, color, style and shine to your life. With MyFitness membership card 10% off all services at MRoom Tartu mnt 13, Tallinn. MRoom is the largest barber shop chain in Europe, with 2 locations in Tallinn: Estonia pst 5 & Tartu mnt 13. With MyFitness membership card 5% off all products. Goldtime is fast growing jewellery store chain in Estonia which provides wide range of high quality jewellery and watches. We always pay a special attention to the assortment of our products, so anybody can find something suitable – trendy watch, classic gold chain or extremely fashionable silver earrings. With MyFitness membership card 25% off all body treatments. With MyFitness membership card 5% off all face treatments. We offer body treatments based on modern technology, and medical aesthetic beauty treatments. Our goal is to bring you positive experiences and to be your safe and trustworthy partner. Treatments are conducted by properly educated and certified medical professionals. With MyFitness membership card 10% off dental medical treatment. Nordic Hambakliinik offers full dental services in the centre of Tallinn. Here you can get help for any teeth problem – from dental medical treatment to implants and aesthetic treatment.